In the last few months I traveled halfway around the world. The trip was like a rock dropped in a lake, and I’m flowing out in the ripples. Opportunities to share the story of Sanctuary of Hope and Pamba Toto abound. I’m swimming hard to keep up. Amidst it all, my children, home on summer break from school, moved in and out of my coming and going. Summer bustled with joy. Now, as they return to school, quiet settles over the house and over my soul. I feel expectant and afraid. But in my heart of hearts I know there is One who hears, and there is One who is speaking. I know, because I can’t deny the whisper, sweet and alluring. 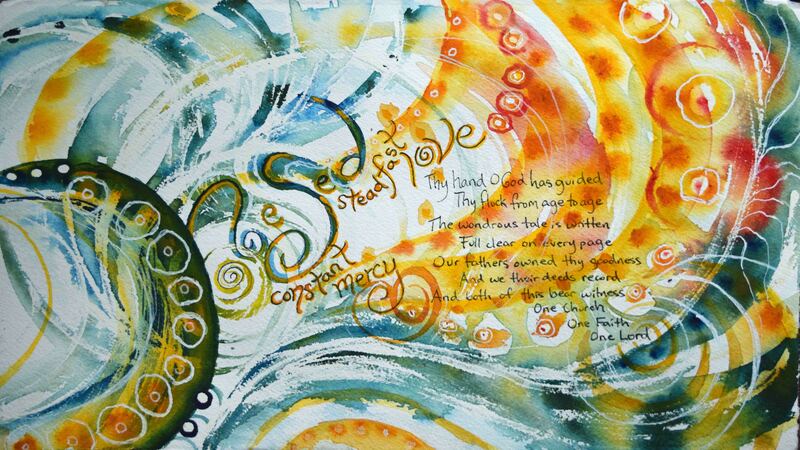 And so I moisten the watercolors and begin again, where I must always begin: in “hesed”, the steadfast love and constant mercy I only hear when I am painting. This is so similar to how I feel when I am writing. I try to ignore that voice too even though the voice is one of Love. There is never a clear reason to resist. It only hurts us really. Always follow that voice Colleen. Thank you so much for your encouragement Teresa. You are consistently one of those voices of encouragement in the forest. Please follow the voice too! That was such a refreshing time, Jody, with you. Thank you for reinforcing that still quiet voice with your encouragement. I just now got to read this. Please keep painting . . . it’s beautiful, worshipful, holy. The tenderest expression of your heart and soul before God. Like Hannah’s tears. Moves His heart (and ours). He sees, He hears, He knows . . . And He answers. Your art touches me in a deep place whenever I see it, and I love reading your thoughts behind your paintings. Keep living truly, beautifully, vulnerably and boldly as you have these past 4 years. You have a special gift that ministers to the heart of God in a unique and beautiful way. And your openness and transparency—your vulnerability—enables you to touch others in a deep way. When Christians fail to be vulnerable, as you have been, hearts are not moved. And that’s why I admire your artistic, open, beautiful heart so much. I can’t even tell you how much your comment means to me! Really it touches me so deeply, I am overwhelmed. I will probably return again and again to it and it will continue to give me hope and courage to paint.